﻿﻿﻿Lots of people are hitting Walking Randomly looking for info about Mathematica 8 and have had to walk away disappointed….until now! Finally, I convert it to a state space model. Update: Mathematica 8 has now been released. See http://www.walkingrandomly.com/?p=3018 for more details. how did you get the plots online. You did a screen capture of the plots or mathematica can export graphs to images? it surprises me how we still don’t have mathcad style unit conversions. @MySchizoBuddy Unit conversions don’t concern me so I’ve never looked at how Mathematica supports them or otherwise. As for the graphs, Mathematica has been able to directly export them to lots of formats for ages now. If you like to use Butterworth filter in Mathematica, look at my demo at WRI demo web site, I have a filter design demo there for this filter. will it be included in Mathematica 8 or it will be sold seperately? “Control theory. There are a lot of interesting methods that have been developed in control theory over the last few decades that actually deserve to be better integrated into general analysis, and model-building, and so on. Well, partly building on the add-on Control System Professional package, we’ve figured out how to real integrate control theory methods into core Mathematica. It’s very strongly based on nice, clean, symbolic representations of control systems. This “unity principle” in Mathematica that Wolfram talks about in the 2009 International Mathematica User Conference will be truly great when it is fully implemented and will be even greater if it will be possible to be done with the Mathematica price kept at the current level. It looks like version 8 will be released soon. DesignerUnits.com gives MathCAD-style units in Mathematica. CAS units need more than conversions. Good code largely hides conversions from the user, who needs other things. Here’s a backgrounder. I’m exploring the v8 Alpha integration. Brian Evans’s old signals package enabled heavy DSP work complete with plots. He showed how to proceed when native plots are missing: roll your own. 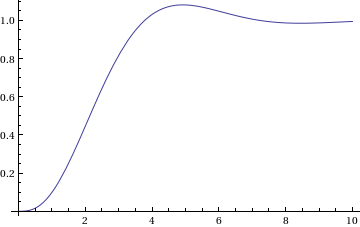 As usual, Mathematica gives a way. 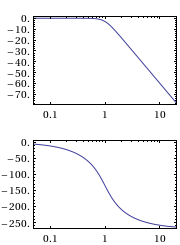 Today the DSP plots are native, but they were always available. P.S. I like Maple too.